On April 3rd, Winkle successfully defended his dissertation! 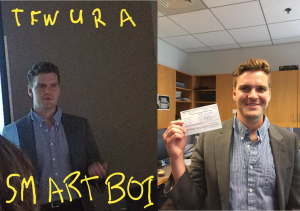 Dr. Winkle not only presented an exciting defense regarding his work in science, but also his excellent, and not at all useless, photography skills! That’s three doctors in three months from the Huettel Lab, and each with a diverse and well-rounded skill set. Congrats Dr. Winkle! Congratulations Amanda! On March 21st, Amanda successfully defended her dissertation. 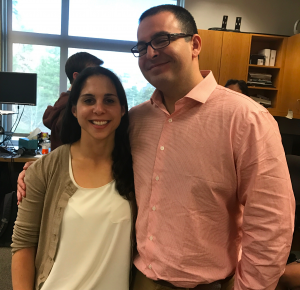 That’s the second newly minted doctor in two months from the Huettel Lab. We wish Dr. Utevsky the best, and again, congratulations! Congratulations to Rosa Li! 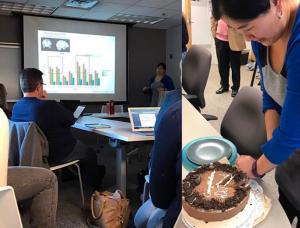 On February 16, Dr. Li successfully defended her dissertation and earned champagne and ice cream cake. That’s what you go to graduate school for, right? Luckily for us, Rosa will be staying at Duke as a Postdoctoral Associate in Decision Sciences. Congratulations Dr. Li!